2010 ( AR ) · Spanish · Drama · PG-16 · 84 minutes of full movie HD video (uncut). 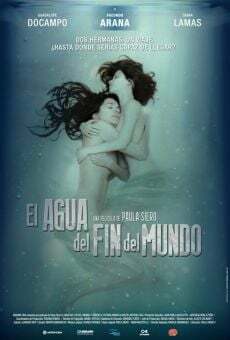 You can watch El agua del fin del mundo, full movie on FULLTV - Laura and Adriana are sisters and live together. Laura works in the kitchen of a pizzeria and supports his sister. Receive news by which they decide to take a trip. Laura touches get the money to do so. Do not guide the desire to travel but to escape, in a poetic way, a present that Laura should return. In this quest he meets Martin, a musician who plays the accordion. Their sexual encounters seduce Laura. When Martin meets Adriana, is also attracted to her. The sisters face. Will Laura, nevertheless, continue trying to get the money to fulfill the wish of his sister? A deeply human story, where love and hate, understanding and anger melt without pause in this intense fraternal bond. You are able to watch El agua del fin del mundo online, download or rent it as well on video-on-demand services (Netflix Movie List, HBO Now Stream), pay-TV or movie theaters with original audio in Spanish. This film was premiered in theaters in 2010 (Movies 2010). The official release in theaters may differ from the year of production. Film directed by Paula Siero. Screenplay written by Paula Siero and Nora Mazzatelli. Given by Daniel Sebastián Ortega. Soundtrack composed by Chango Spasiuk. Film produced and / or financed by Magma Cine and Primer Plano Film Group. As usual, the director filmed the scenes of this film in HD video (High Definition or 4K) with Dolby Digital audio. Without commercial breaks, the full movie El agua del fin del mundo has a duration of 84 minutes. Possibly, its official trailer stream is on the Internet. You can watch this full movie free with Spanish or English subtitles on movie TV channels, renting the DVD or with VoD services (Video On Demand player, Hulu) and PPV (Pay Per View, Movie List on Netflix, Amazon Video). Full Movies / Online Movies / El agua del fin del mundo - To enjoy online movies you need a TV with Internet or LED / LCD TVs with DVD or BluRay Player. The full movies are not available for free streaming.